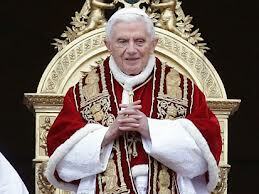 Pope Benedict Retires…and Gets Lambasted. Pope Benedict announced his retirement today, stating that his age and health were his deciding factors in renouncing the papacy. Catholics, across the board, denounced his decision. I believe they are wrong. Today, I read comments and opinion pieces, everywhere from left, right and center. But what I did not hear from anyone was what Benedict himself said prior to being elected. He said he did not want to become pope; he wanted to become a librarian. Imagine if you will yourself being elevated into a position you did not want and with which you felt uncomfortable. Further, imagine your health failing along side your discomfort with your job. Would you not want to give up the job that increases your health risks as well as your mental anguish? Benedict never wanted this job and pleaded with his predecessor to be given another job. He knew his heart and talents…yet, he was thrust into this position – a position he did not want and for which he felt unqualified. I’m not a Catholic, but I have great sympathy for the enormous decision he made. It took great courage to step aside…and great humility. I honor the courage of his decision as should we all. It takes a great man to know when to step aside, knowing he has neither the desire or health to continue. As this moment, Catholics everywhere should be proud of their Pope, not as the infallible leader the Roman Catholic Church demands, but as a man who knows his heart and abilities as this great moment in history requires. Benedict gives the Catholic and Christian world at large an opportunity to begin anew with a younger, more energetic religious leader to meet the challenges of a new century while vigorously defending the age old tenets of all theologies of caring, sharing, compassion, respect, charity, forgiveness, humbleness and sharing. I don’t know whether the Catholic Church will take up the challenges laid out before it in this new Century or whether it will turn its back. Only the Church knows its age old prophecies. But Benedict should be praised for his service rather than damned for his unwillingness to continue in a position for which he believed himself incapable of continuing. « GOP Elites Choose to Deny 21st Century Reality…At Their Risk!